Treating Cadmium Toxicity with Garlic and Ginger. "Investigation of Effects of Time of Measurement and Modes of Administration on Cadmium Accumulation in Rat Liver under some Medicinal Plants Food Supplemented Diet." Nwokocha, CR., et al. The University of the West Indies, Mona Campus, Kingston, Jamaica, West Indies. We are exposed to the toxic metal cadmium through occupational exposures, food, air, water, and products of industry. Cadmium can cause damaged enzymes, altered lipids, free radicals, tissue oxidation, impaired membrane functions, and reduced ability to repair DNA. Symptoms include increased blood pressure, anemia, osteoporosis, heart problems, protein in the urine, kidney malfunction, liver disease, emphysema, pulmonary edema and death. Chelation therapy prevents the damage by cadmium, but does not reverse the damage already done. Medicinal plants are being studied to reverse damage from heavy metals. 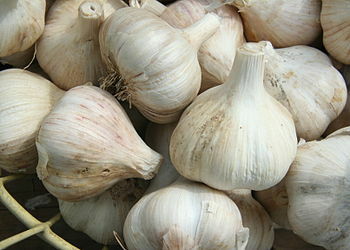 Garlic (Allium sativum) is an antioxidant and heavy metal chelator. Ginger (Zingiber officinale) is a free radical scavenger and antioxidant. Garcinia kola* is an antioxidant and poison antidote and tomato (Lycopersicon esculentum) has strong antioxidant activity. They all reduce liver toxicity. The present study is of the ability of the above plants to protect the liver of rats by different times of administration to the rats. All rats were exposed to 200 ppm cadmium chloride in tap drinking water. One group served as control, receiving only rat chow and cadmium water. Group two was fed cadmium and rat chow mixed with one of the plants starting at the same time (to test whether the plants increased metal absorption). Group three was fed rat chow and water mixed with cadmium for the first week, and then, rat chow with one of the four plants without cadmium in the water for weeks two through six (to see if the plants prevented or reduced absorption of the metal). Group four was fed rat chow plus one of the plants without cadmium water on the first week, followed by normal rat chow plus cadmium water for the last five weeks. Every two weeks, five of the animals from each group were sacrificed and studied to see if they were protected from toxicity. The goal was to see which plants protected the livers of the animals and which procedure worked best. A calculation was used to determine the amount of cadmium to which each animal was exposed. Interestingly, the findings were that all plants reduced liver cadmium levels without regard to the procedure used. CONCLUSION: Food additives, such as garlic, ginger, tomato and Garcinia kola, added to rat chow can reduce the accumulation of liver cadmium due to reduced absorption and increased excretion. NOTE: *Garcinia kola is known as bitter kola. To read the author’s abstract of the article in Polish, click on the title of the article. Then, to read the full article in Polish, click on the full text icon.